The autonomous and privacy-oriented digital currency Decred, which launched on February 8, 2016, at $1, is now trading at $91 as of May 30, 2018. At a time when the rest of the market is declining, Decred’s price rise has not escaped the attention of the cryptocurrency mining community either. As such, hardware companies are now launching dedicated ASIC miners tailored explicitly for Decred mining. While most cryptocurrencies, including bitcoin, employ a single consensus mechanism, Decred uses a hybrid of the Proof-of-Work (PoW) and Proof-of-Stake (PoS) mechanisms. To cater to the evergrowing hardware demands of miners, Obelisk has launched a custom 28nm ASIC and calls it the DCR1. The ASIC has a hash rate of 1200 Gh/s and has a power consumption of less than 500 W.
As a result of several manufacturers rolling out dedicated mining hardware for the currency, the Decred network’s hash rate has increased from 5,000 Th/s to 12,000 Th/s within two weeks alone. In fact, that figure currently stands at 16.3 k Th/s. These powerful ASICs will likely render most of the currently used GPU mining pools useless. Miners validate transactions in the network and ensure that every transaction is following the defined rules. For doing this, they are rewarded with a specific amount of cryptocurrency. Factors to consider when calculating profitability from an ASIC miner includes the hash rate of the chip, the difficulty of the network, the power consumption of the machine, cost of electricity, fee for mining in a pool, and the number of coins that are rewarded per block. The hash rate of the machine is the rate at which it processes blocks and the higher the hash rate, the higher will be the profit. The Obelisk DCR1 is also competing against the likes of the Ibelink 6 Th miner. Ibelink DSM6T reportedly achieves a hash rate of 6.23 Th/s, making it the fastest dedicated Decred miner in the world. The DSM6T has a power consumption of 2.1 kW and weighs around 17.6 kg. Bitmain, the manufacturers of bitcoin’s most powerful and profitable ASIC miner, the Antminer S9, is also expected to roll out a dedicated Decred mining ASIC. The Bitmain Antminer S9i-14.0 has a hash rate of 14 Th/s at a power consumption of 1.28 kW. Bitmain is the market leader in mining hardware and has a near monopoly. It is widely expected that the company will launch a dedicated Decred ASIC by Q3 2018 to maintain its market share in the 16nm ASIC sector. Baikal has a series of ASIC miners programmed to work with the Blake256 algorithm as well. 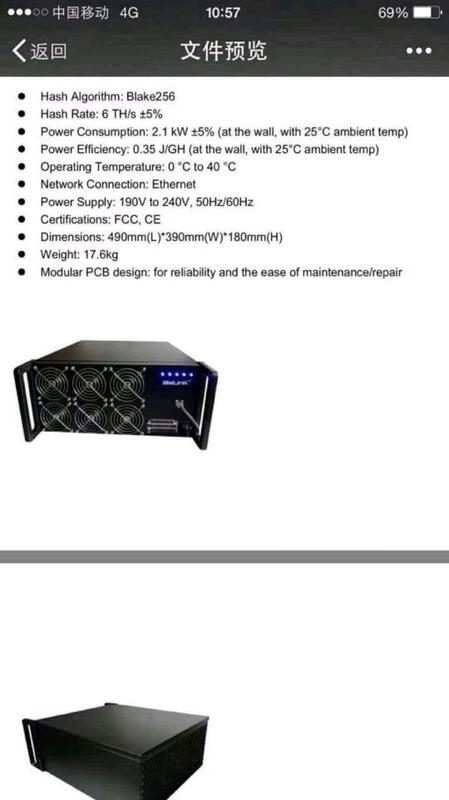 The Baikal Giant B Miner is the company’s premium product and offers a hash rate of up to 160 Gh/s. The cost of the ASICs can vary from $1,000 all the way to around $10,000. The Ibelink DSM6T, for example, which goes on sale on June 5, 2018, will cost $9,999. The Obelisk DCR1, on the other hand, can be purchased at $1,999. Any miner that wants to set up a Decred mining rig needs to consider the initial upfront cost for a powerful ASIC miner as well. While the expensive ASICs have a higher hashrate, the time for return on investment will remain approximately the same, increasing risk. However, a higher hashrate ensures profitability even when the network difficulty goes up. Lastly, the power consumption of the chip is another factor to be considered. Power costs vary as per the miner’s geographic location and can often represent a miner’s most significant expense.